Its a double whammy with this blog post – showcasing two new advanced ‘trick definition’ videos and giving the answer to our recent “Name That Trick’ competition where you could win a North Airstyler Harness. Most people got that but it was the second one that cause quite a few problems! We had back to blinds & back mobes – WRONG! Alot of people got close with a Slim Chance but unfortunately WRONG! For the Slim the body needs to get fully inverted during the pass. So that left the correct answer… the NIS (Non-Inverted Slim) and then just to catch a few more people out there was a grab thrown in for good measure! Now the last thing regarding the NIS, there was a pretty even split between answers for the NIS and the S-Mobe. 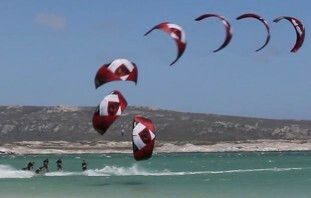 Essentially they are the same trick (and in Wakeboarding the NIS doesn’t really exist) but in kiteboarding there is a small visual different between the two. The NIS is a front roll with a frontside 360 where as the S-Mobe is a s-bend with a frontside 360. Other than the front roll / s-bend difference you can usual see the difference in the frontside 360 – the bar pass on the NIS happens slightly off axis where as the S-mobe is a very flat frontside 360. As we are feeling generous (and we think its pretty much the same thing) we have included all those who answered NIS or S-mobe! Anyway, the moment you have all been waiting for… and the winner of the North Airstyler Harness is….. PHILIP SNOUCKAERT!! These videos do not have any in depth instruction but instead can help you quickly and visually define a particular kitesurfing trick. Whether you want to line up your next kiting progression, find inspiration or just appear more knowledgable down the beach these videos are an easy way to get clued up fast! If there are any tricks you would like us to cover in our ‘Trick Terminology’ videos then just add them into the comments below and we’ll get it done!